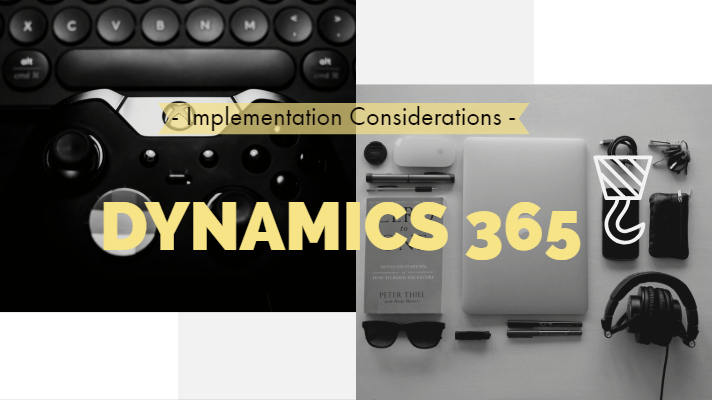 In this post, I would like to highlight about the considerations we need to make before stepping into a Dynamics 365 for Finance and Operations implementation project. This is based on my learning from my current implementation project on Dynamics 365 for Finance and Operations Enterprise Resource Planning(ERP). What is Dynamics 365 for Finance and Operations? Dynamics 365 for Finance and Operations(formerly known as Microsoft Dynamics Ax) is an integrated, adaptable, business management solution that integrates all facets of a business and is a part of the Dynamics 365 suite of ERP (Enterprise Resource Planning) and CRM(Customer Relationship Management) solutions. There are multiple ways in which we can set up Microsoft Dynamics 365 for Finance and Operations. Check with the customer about the implementation methodology at the initial stages of an implementation project. In the On-Premise edition of Dynamics 365 for Finance and Operations, there is an Azure connector involved that is linked to the Azure subscription. This is an Infrastructure as a Service. The entire platform, the application is managed and owned by the partner/customer. Cloud + Edge On the Cloud, Dynamics 365 for Finance and Operations/Unified Operations can be deployed either as a Cloud-solution or as a hybrid solution (Cloud + Edge). To get access to the environment to ensure that the user is added, as a project team member. In the project user management screen, there will be multiple users assigned to various roles. The other details include those numerous user’s email id, the organization they belong to and the administrator & environment manager who has added that user. Note: Every LCS project will have at least one project administrator, by default. Before adding the users to Dynamics 365 for Finance and Operations, ensure that the users are added to the Azure Active Directory. You can add the user as a guest user by inviting the guest user. The invite will be sent out in an email. Ensure that the guest user has a valid enterprise id. The environments mentioned above have to be set up through Microsoft Dynamics Lifecycle Services. 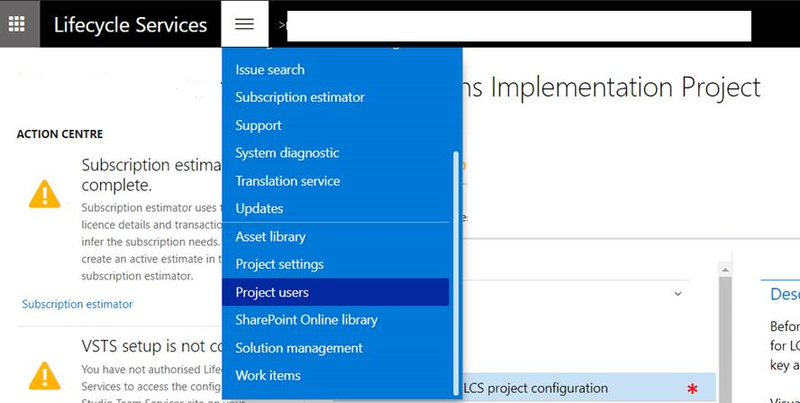 There will be a Visual Studio Team Services (VSTS) site collection setup in LCS and a team project. The site collection will be https://<sitename>.visualstudio.com. 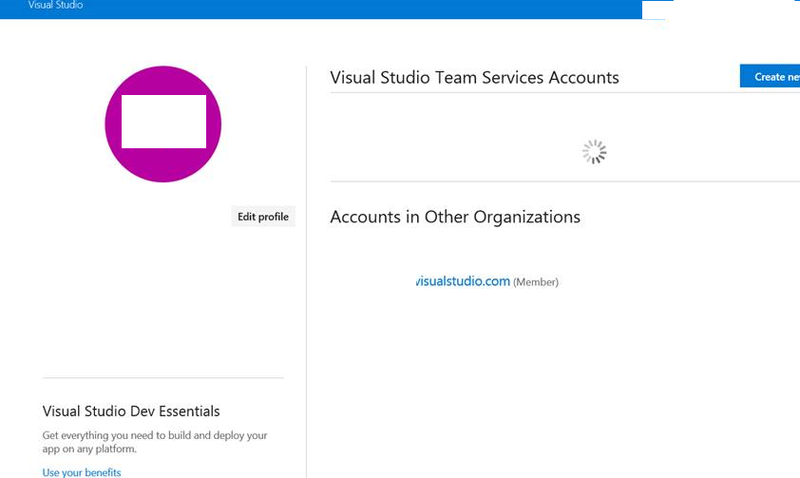 If an individual is not having access to the VSTS, then refer to the Access section for more details. 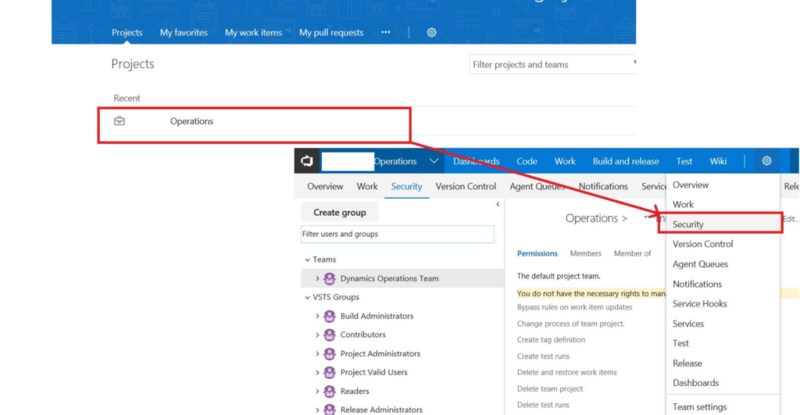 Check if VSTS is configured for Dynamics 365 for Finance and Operations in Lifecycle Services. 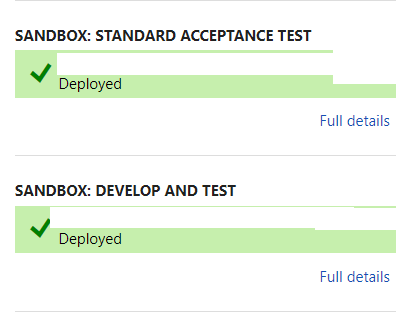 The MSDN Subscription is attached to the VSTS. If there are no valid MSDN Subscriptions associated with a user id, then the user won’t be able to access the site collection https://<sitename>.visualstudio.com. Once you login to Visual Studio Online, the team member should be able to access the site and must be assigned as a team member on the site https://<sitename>.visualstudio.com. The project team member should have a valid MSDN subscription to view the team project. Select the link, and one will prompt with the login page. One should be able to see a project called Dynamics 365 for Finance and Operations. 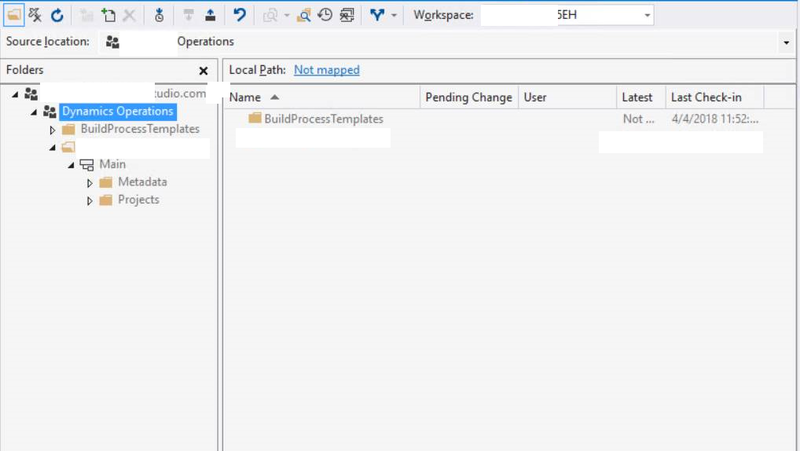 For instance <Dynamics365ForFinOpsProjectName>. Ensure that all the required project team members are assigned as a team member to this project. Select the link Dynamics Operations. A Page will show up. Hit the Gear icon and then choose Security as depicted in Figure 6. 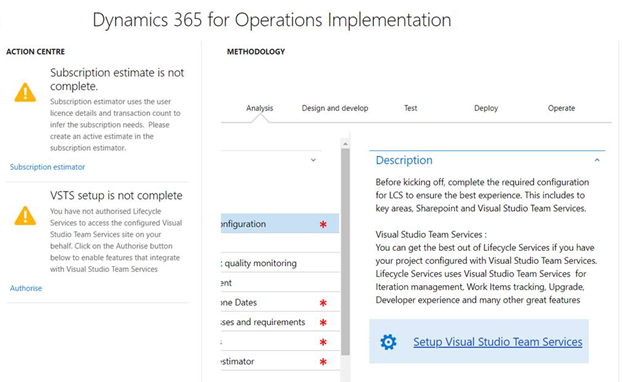 Dynamics Operations Team (To access the Interactive Dynamics 365 Team Foundation Services branch). 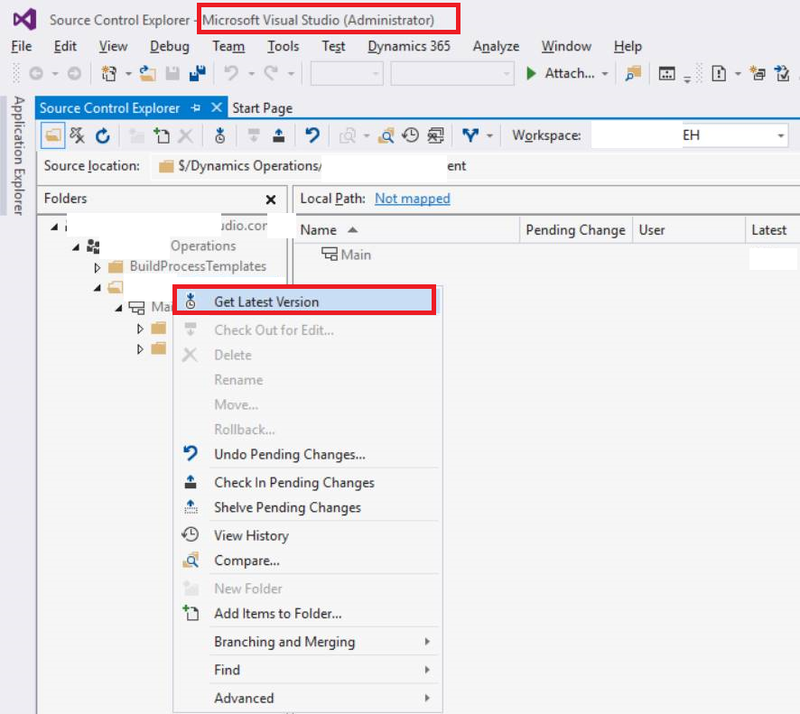 Build Administrators (If we are going to create branches/will be merging branches/will be setting up test scripts created in the Source Control Explorer in Visual Studio 2015). There is a repository called Main that we have converted to a Branch. To do this, we need the Build administrator privileges in Visual Studio Team Services. Do a Get Latest Version on the repository. If we are going to be creating new reports in PowerBI, ensure that we have the following pre-requisite setups complete. Office 365: Ensure we are added as a member of the Office 365 Admin center. Enable the PowerBI Pro licensing from the Office 365 Admin center. In the case of PowerBI Premium, the setup is a little different. Has the user assigned in PowerBI Service with the required privileges to create, edit and modify new or existing reports? 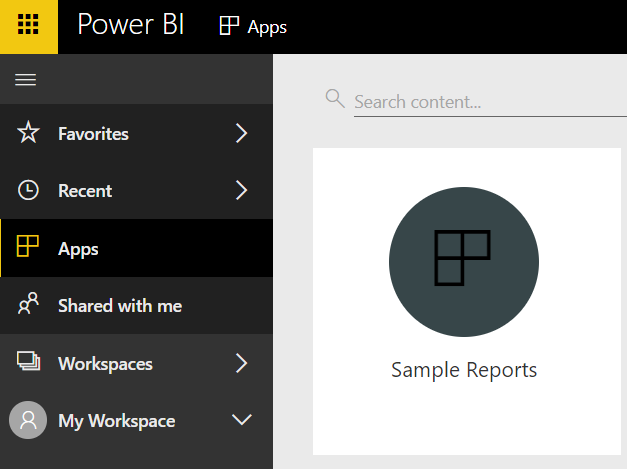 PowerBI Pro licenses will ensure that we can publish the developed reports in the App Workspaces. This feature is only available with PowerBI Pro or Premium licenses. An example is as stated below. The LCS subscription ID is different from the Azure subscription id. We need to link the LCS subscription id to the Azure subscription id to enable hosting of Microsoft Dynamics 365 for Finance and Operations. Remember, this is only applicable in case of an On-Premise Dynamics 365 for Finance and Operations implementation. The other components that one can leverage with every instance of Dynamics 365 for Finance and Operations include Common Data Service, PowerApps, and Microsoft Flow.